Portland politicians don't hate business, they just play favorites. Let's take the "crony" out of capitalism! Portland is a crazy place to do business. If you're on the "nice" list, you get handouts of taxpayer money. If you're on the "naughty" list, you get hassled and shaken down. Check out this story of two Portland businesses. First, Willamette Week reports about a struggling small business owner (actually it's a tiny business) who is being hassled by the City of Portland's Bureau of Environment Services. Overreaching bureaucrats are forcing mead maker Stung Fermented to put in an expensive "wastewater inspection port," which is a requirement that’s only supposed to apply to large industrial sewer users. Since it'd take two years to fight it in court (plus tons of money), Stung Fermented had to bend to the bureaucracy. 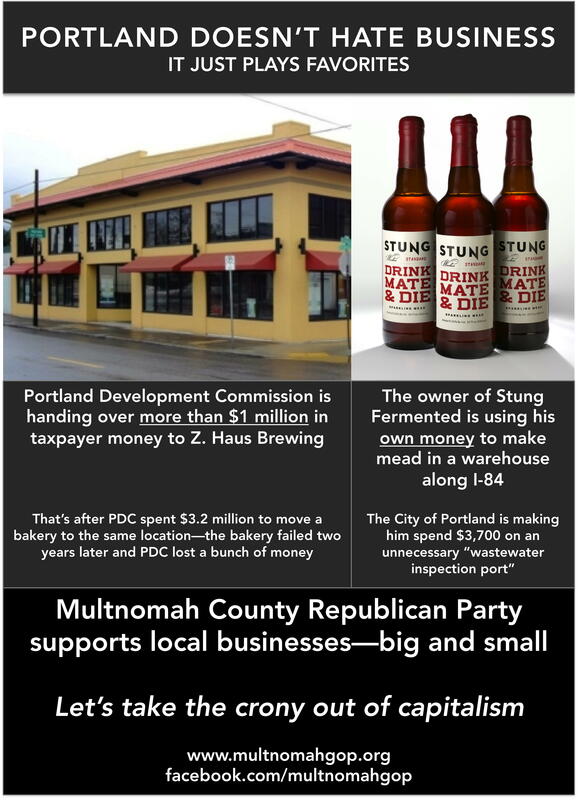 While one micro business is getting burnt by the city's bureaucrats, the city's Portland Development Commission is handing another microbrewery more than one million dollars in taxpayer money. And, it get's worse. A few years ago, PDC spent more than $3 million to move Ararat Bakery the exact same location as the Million Dollar Microbrewery. Two years later, the bakery went out of business and PDC was stuck with $653,000 in unpaid loans. Bottom line: All together the city has spent more than $4 million to attract business to one corner in Portland, and there is still no business on that corner. At the same time, the city has no money to repair roads. Crazy, huh? Starting a business is big part of the American Dream. Republicans support free enterprise. Free from bureaucratic burdens. Free from cronyism. Good government is a concept that crosses party lines. Please help Multnomah County Republicans turn Portland into a city that's open for all businesses, big and small. The easiest way to help is to follow our donate link: http://multnomahgop.org/donate.